Throughout this academic year I've been keen to start volunteering. Less commitment than a job, but more stimulating than bed-living with Netflix permanently streaming, it seemed to me like a fab way to complement my minimal hours of university contact time. Despite the highly achievable nature of my aspirations, I spent a lot of time faffing. "Where should I volunteer? Should I bother?" I would ask myself while eyeing up my Netflix list wondering how I could possibly find the time to watch EVERYTHING I'd decided was a must-see - in itself as taxing as a degree, I reasoned. Yet, after talking to a friend, who told me, in the most benevolent way, to stop talking about doing things and start just DOing, I decided it was time to quit the ol' faffing and heed her advice. That day I handed in my volunteer application at Books for Amnesty. 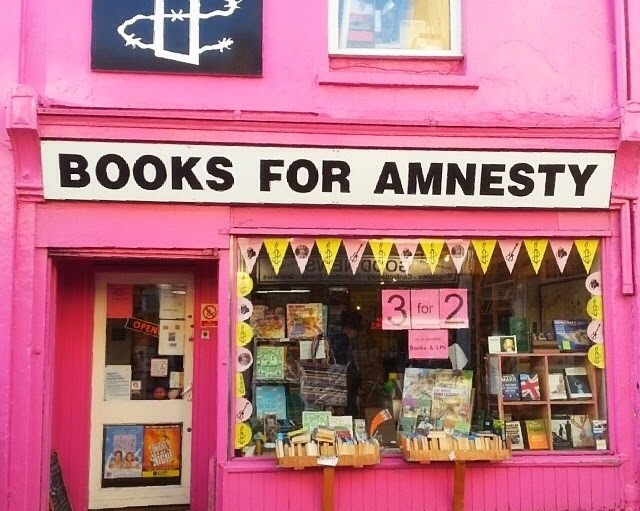 I'd walked past its glorious pink walls countless times on my ventures into town, and often stopped to have a nosey at the array of paperbacks lining the front window, but had only ever been inside once. After a quick browse I'd discerned nothing of interest, left, and almost completely forgotten it. What a silly sausage. Thankfully, they took me on. I'll write more another time about the shop, as the people and cause are all insanely interesting. But for now, let's talk about the stock. On Friday I spent a large portion of my shift perusing the shelves, locating many books from my course lists over the years for a lot cheaper than from Amazon (again, what a silly sausage), and many from my Must-Read list. One of the perks of volunteering in a bookshop is that I get a 50% discount. This is especially fruitful when the majority of books cost £2 originally. A hardback cover of Tom Wolfe's Bonfire of the Vanities cost me all of 50p. Hot damn. Later that day, I journeyed to my friend's house in Hove for some home-cooked dinner and to watch some TV on an actual television (!) rather than a dinky iPad screen. I couldn't help but flick through all the channels repeatedly under a spell of nostalgia. Probably very annoying for my friend. Once channel-flicking had ceased, food had been eaten, and red wine drunk, I decided to call it a night and trek home, only to miss my intended train by one minute. Furious, I blamed it on all the mashed potato I'd consumed weighing me down. I wandered sadly to the waiting room on the platform and plonked myself down on a slightly ripped sofa, glumly surveying my surroundings. In the corner of the room was a bookcase. Instantly I dismissed it, sure it was destined only to bear low-brow chick lit/ run of the mill thrillers. Neither of which are really my cup of tea. Now, maybe I should've known, judging on my "Hove, actually..." setting (the middle-class, elderly encompassing sister of Brighton) that some upscale literature may be larking about. But, still, imagine my surprise at seeing out of the corner of my eye the spine for Filth by Irvine Welsh. And there! Right next to Filth was Glamorama by Bret Easton Ellis. A torn up sign asked politely for £1 for books in good condition. Without hesistance I paid my dues, picked up Hip Hop America (hip hop hunny no #1 over here) and proceeded to board my train back to Brighton. 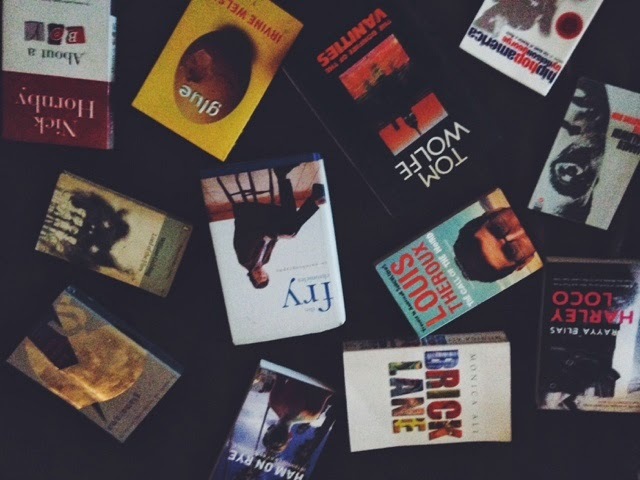 Over the course of the day I picked up 12 books in total for under a tenner. 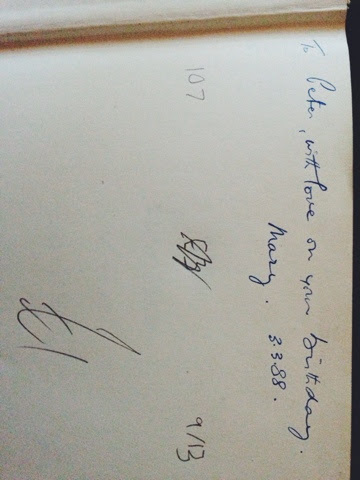 In some of the books I acquired, and in lots of the books accommodated by Books for Amnesty, messages have been inscribed. I find it such a lovely idea (besides perhaps from the germs factor) that all these books have histories. I know not who has owned them previously, who has been inspired by the words within them/ the thoughts they provoke, or who is set to own them in the future. All I know is that when I'm finished with them I think I'd like to pass them on, too.